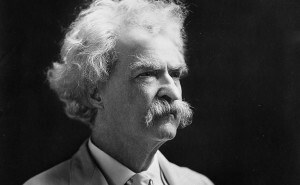 Raised in the Mississippi River town of Hannibal, Missouri, Samuel Langhorne Clemens learned to love life on the river. He worked as an itinerant printer and journalist, but his favorite job was as a riverboat pilot before the Civil War, a position from which he observed human nature on the rough-and-tumble American frontier. When he began to write humorous stories—his first big hit, “The Celebrated Jumping Frog of Calaveras County” (1865) was a slice of life from California gold country—he adopted the pseudonym Mark Twain, the call of the Mississippi riverboat leadsman indicating a depth of two fathoms, ample for safe passage. As Mark Twain, Clemens wrote often hilarious (and tremendously popular) works that nevertheless portrayed the darker side of human nature and of life on the frontier. His Adventures of Huckleberry Finn (1884) is a masterpiece of narrative art, a look at life in America on the eve of civil war through the eyes of a high-spirited, warm-hearted twelve-year-old orphan.